Super fun! We had two families of four (2 adults 2 kids x2). Clues are challenging, but can be solved. We did "kidnapped" theme which was eerie, interesting and provocative. I would highly recommend for a night of team building and laughs. Kayla is helpful, friendly and encouraging. Just got done experiencing our first Escape Room adventure! What fun the Christmas Room was! 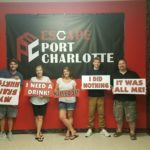 We made it out with only 22 seconds to spare! We are already making plans to go back after the holidays and try another room. I would HIGHLY recommend this activity to anyone wanting to do something fun and different in the Port Charlotte area. The Keys to Christmas room was a blast! There were some super unique elements and puzzles in the room with plenty to keep you working but not too much to get overwhelmed with. The owner Kayla is extremely friendly and passionate about Escape Rooms and it shows! Overall a great experience! This was my first time doing an escape room and I had a great time! Went with my family and we failed miserably haha. We chose to do “Kidnapped” and I highly recommend it! Only complaint is that it smelled really foul in the lobby. Never done an escape room before today. It was so much fun and a great group activity. The staff was super friendly and pleasant. Family Friendly Activities Near Laurel, Florida!